Here, for your enjoyment, is a set of 8 FREE Social Bookmarking Buttons designed by ME!!! That's right, folks, I've been playing around with all sorts of blog decorations to share with you and this is just the first of what is to come! I hope you enjoy these and remember, if you don't know how to install them, just check out How to Install Social Bookmarking Buttons (on this site!). So what are you waiting for? 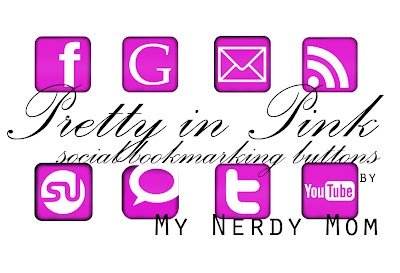 Go download your Pretty in Pink Social Bookmarking buttons now!